SAM TAN'S KITCHEN HAS MOVED! Please visit the new website/online store at www.samtanskitchen.com. You can also follow Sam on Instagram, Facebook and Twitter. Thank you! Crispy and golden on the outside with a spicy savoury potato filling, this scrumptious Malaysian snack is sort of a cross between a samosa and an empanada and is usually found sold freshly fried at roadside stalls. Some versions don't bother with the spiral crust, but I can assure you it adds a delectable flaky crunch that completely elevates this traditional teatime treat to another level. The recipe below is easy though a little tedious with the multiple steps, but creates a pastry that stays crispy even when the puffs have cooled down. Form them as large or small as required- they also freeze well, so make ahead of time and fry straight from frozen when needed. Divide and roll into two equal balls, then cover (otherwise it will dry out) and leave to rest for 30 mins. Knead 75g softened butter into 150g flour until shiny and smooth (I used to do the shortcrust pastry thing by cutting in cold butter cubes, but I've discovered room temperature butter actually works much better!). Divide and roll into two equal balls. Simmer, stirring occasionally until all moisture is absorbed and potatoes are tender. Leave to cool thoroughly before using. Enclose one ball of grease dough neatly in a ball of water dough. then roll up tightly from one end to the other like a Swiss roll. Turn the rolled up tube 90 degrees (so one end faces you) and repeat the previous step- flatten it thinly again lengthwise into a long oval , then roll up tightly like a Swiss roll. With a sharp knife, slice into 1cm discs (or thicker if making larger puffs). The spiral layers should be clearly visible. you can get it without the layers splitting apart). 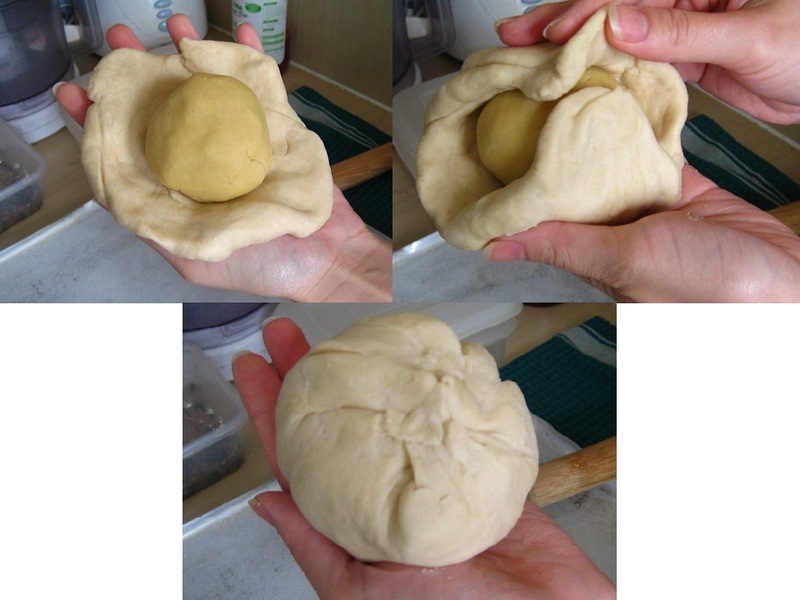 Place the rolled out pastry onto a curry puff mould (or use your palm if you don't have one). Fill with just enough potato curry in the middle- not too much or it will burst! Fold the mould over carefully to enclose, peeling off any excess pastry from the sides. a 45 degree angle to form a rope as pictured. Deep fry in hot oil over medium-high heat, tossing continuously until golden brown. and drain on kitchen towels before serving. Hi, tried your recipe today. It's my second attempt at making curry puffs (made them yesterday from another recipe, but was a flop). So I thought I'd try your recipe, since it has step-by step instructions and the results look great. I had to add a little bit of cold milk to the oil dough to help it come together, but otherwise, the pastry was perfect! My pleating doesn't look anywhere near as good as yours, though. I tried out your spiral curry puff recipe and they were GREAT!!! Thank you very much for the recipe. I must say that after trying out other curry puff recipes which did not work, I gave up until I saw your recipe. The pastry was so crispy I could not believe I made it. My pleating did not look anything like yours:( But I know for sure this is a recipe keeper & I will recommend others about your recipe. 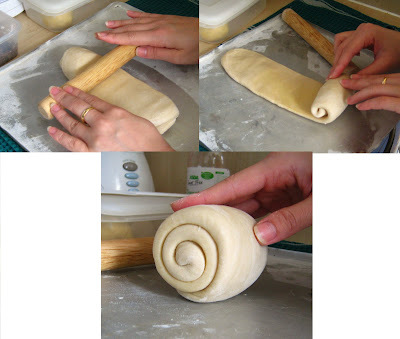 i'm googling for this spiral currypuff recipe & which it lead me to your beautiful blog! TQ Samantha for sharing all the details/tutorial you had given here. btw, it will be nice if you can add chatting box apps on ur blog....hv a gd day! Just realised I never saw this comment- thank you Sharon! Hope your attempt worked out well! I tried your recipe 2 times, everything tastes great except my pastry does not finish light/flakey, any suggestions for what I could be doing wrong or am missing? Thank you! Hmm off the top of my head I think maybe try rolling the pastry as thin as possible before adding potato filling, so it doesn't end up too doughy? It should almost burst between the layers, just thick enough to hold everything in. Also and make sure your oil is at a good medium heat, it should sizzle upon contact but not brown too quickly. Hi... my first attempt to make a curry puff and i followed your dough recipe. Although some didn't turn out too flaky but overall it worked! The dough was really crispy and i am definitely going to make some more! After discovering curry puffs at one of our local Thai places in Brooklyn, I thought I might be able to try making them (and much more cost effective!). After finding your website, I am inspired to go ahead and try my hand! Im curious, have you tried baking them with an egg wash? Hi Meredith, unfortunately baking won't produce the correct crisp flakiness, you'll have to deep fry. Great step by step tutorial - I can't wait to try them this weekend! Thanks Sam. I've done puff pastries many times using the French Method but it was tedious and involved many steps of folding and refrigeration. I saw your method and instantly, it was quick, simple and within 30 minutes, I was rolling it to take shape. Success! I will be using the dough method in many more recipes- as pie crust etc. BTW, I baked mine and it was unbelievable- crispy not crumbly, stayed in form and can be frozen, re-heated in a toaster oven directly. The recipe and the method is a keeper. My friends will be amazed at my new culinary secret. Thanks a million for sharing. Hi Peregrino! I didn't invent the method so I can't take credit for that, but so glad to hear you liked it :) Never thought of it as a replacement for puff pastry though, that's interesting I must try it one day! Thanks for visiting and sharing your experience! Hi Cyndi! Yes you can absolutely do that! I've been told some people freeze them too and fry them straight from frozen (though I've never done it myself). Just wud like to check , my dough split before i fold the mould. Kindly adv which method i didnt follow correctly. Possibly you put too much filling or rolled the dough out too thin? It takes a bit of practice, you should roll it firmly so the layers are pressed together, but not too thin that it bursts with filling. If it's just a small split here and there, you can actually "cheat" and reseal the holes by pinching together with your fingers (once it's fried no one can see). I got my moulds in Malaysia... not to worry though, many people make it without a mould, it just takes some practice to fold it symmetrically. i got mine at Bake With Yen in Taman Megah PJ, most baking supplies stores and even supermarkets like Tesco and Giant sell them in the baking section. Hope that helps! thank you so much for the prompt reply. Hi Arfi! You're very welcome, glad you liked the recipe and thanks for sharing/crediting! Sorry what type of flour should be used? Normal all-purpose plain wheat flour. file it. Then I decided to google it. I am glad I found your beautiful site and all the lovely receipes. I am making curry puff for a friend's 40th wedding anniversary. Keep up yr good blog. Hi, Samantha, I was making you Malaysian Mashed Banana Fritter and they did not come out round/oval like yours. I found I had to use a lot more flour to thicken them and was afraid of using too much, so they were a little bit loose going into the oil. Do I just use more flour until I get the consistency of yours? Yes, try a bit more flour and also make sure your oil is hot enough before you spoon it in, it should sizzle and puff up slightly straightaway. The consistency should be like a drop batter, not too loose but not too stiff either. This looks so amazing and I can't wait to try it even though I shouldn't be eating any of the ingredients in the list (for health reasons)! hehe! 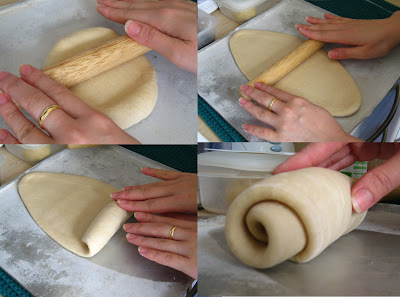 When you roll the dough out, try making it thicker so they don't split so easily, and also press the dough with your fingers firmly to make the layers stick together better before frying. It takes some practice but that should help. Sam, thank you so much for posting the recipe! I'm Malaysian living in idaho and for the first time in my life, made my own currypuffs!! I have a question about the water dough, I looked at different recipes for spiral curry puffs and it looks like yours is the only one I've come across so far that requires an egg. Why is that? My results have been so good with your recipe I don't want to attempt another, but I was curious about your addition! Thanks again! I don't recall now why I chose to add the egg or if I ever tried this recipe without it... but I believe in general, the protein in the egg helps any dough become silkier/ easier to work with/ less tough, and also promotes browning and minimizes crumbliness. Some people add it to pastry or pie crust dough too. Hope that helps! Hi there can fry them the next day after preparation? I already tried this recipe today and it turned out great. Thanks for the recipe. I will try your recipe soon since everyone said your recipe is great. However, can we bake them instead of deep fry? SAM TAN'S KITCHEN HAS MOVED! Please visit the new website/online store at www.samtanskitchen.com. Also, follow Sam on Twitter and Instagram @samtanskitchen, and on Facebook www.facebook.com/samtanskitchen/.